The 2011 National census lists 123 Nepalese languages spoken as a mother tongue (first language) in Nepal. Most belong to the Indo-Aryan and Sino-Tibetan language families. Most of the languages are written using the Devanagari script including indigenous languages. 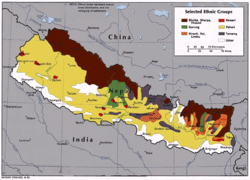 Nepal’s languages are mostly either Indo-European or Sino-Tibetan, while only a very few of them are Austro-Asiatic and Dravidian. Out of 123 languages of Nepal, the 48 Indo-European languages,which are of the Indo-Aryan (Indic) sub-family (excluding English), constitute the largest group in terms of the numeric strength of their speakers, nearly 82.1% of population. Nepali, Maithili, Bhojpuri, Tharu languages etc. fall in this group. The Sino-Tibetan family of Nepal’s languages forms a part of its Tibeto-Burman group. Though spoken by relatively less number of people than the Indo-European family (17.3% of population), it includes a greater number of languages, about 63 languages. Languages belonging to this group are Tamang, Nepal Bhasa (Newari), Magar, Limbu language etc. The small declining number of Dravidian languages are represented by Kurux, and the Munda languages of the Austroasiatic family by Santali and Mundari. The indigenous languages of Nepal that predated the influx of Indic, Tibeto-Burman, and other families barely survive in the Kusunda language, which is nearly extinct today. Nepal also has at several indigenous village sign languages, Jhankot Sign Language, Jumla Sign Language, and Ghandruk Sign Language, in addition to the Nepali Sign Language designed for national use. Article 6: All native languages spoken in Nepal are National languages of Nepal. Article 7b: Beside Nepali language, the Provinces can choose one or more other languages spoken by majority population of that province for government work. ^ "Major highlights" (PDF). Central Bureau of Statistics , NepalI, Maithili and other Nepalese languages. 2013. p. 4. Archived from the original (PDF) on 17 July 2013. Retrieved 12 September 2013. ^ a b c "Population Monograph of Nepal Volume II (Social Demography)" (PDF).